Kristopher Boesen is true hero and his story is simply exquisite. 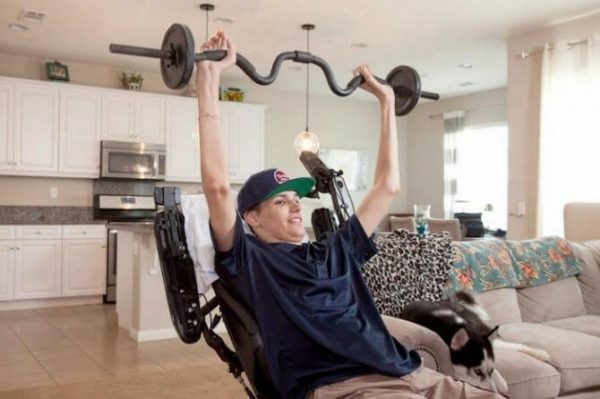 He got into a car crash which left him paralyzed from the neck down. After his vehicle lost control due to a slippery road, he hit a tree and a lamp post. The initial doctor prognosis was that he might never be able to move his body from the neck down. Having in mind his condition, Kris was given the opportunity to go through a procedure involving stem cells, which ‘have the capability to repair injured nervous tissue through replacement of damaged cells‘. This method had no clear guarantee of improvement but Kris felt he had nothing to lose at the time. Kris began the treatment in April with the help of Dr. Liu, who injected 10 million AST-OPC1 cells directly into Kris’ cervical spinal cord (AST-OPC1 cells come from donated eggs that are fertilized in vitro (i.e. in a petri dish). It took Kris only three weeks of therapy to notice the first signs of amelioration. Also, he needed only two months to be able to talk on the phone, write words and control his wheelchair. He also retrieved his main motoric functions. Furthermore, Kris was able to bring back two spinal cord levels that were responsible for his mobility. Soon, he could regain his basic movements and feel independent again. This experimental treatment was highly effective for Kris, and although the medics could not promise any progress, he managed to heal completely. Dr. Liu and his team are also collaborating with ‘associate faculty based in departments across KSOM and the University to study stem cell-driven new medicine‘, so that this research can be developed even further. The stem cell treatment is expected to be successful for curing other disease, such as Parkinson’s disease, diabetes and even cancer.